Alison Crosthwait is a psychotherapist and writer living in Toronto, and over the last few months I’ve had the joy of not only reading her open and thought-provoking posts on her website, ‘The Good Therapists‘, but also of occasionally corresponding with her and sharing ideas. I hope it’s accurate to say that I think we both get excited by creativity and ‘projects’, and back in April we did our first live Twitter chat on the subject of therapy breaks. It was our first experiment in taking a therapy-related subject of mutual interest, and tackling it each from our perspective of therapist and client, by simply letting a dialogue unfold*. One could argue that the therapist has the advantage here as they have experienced ‘both sides’ of the equation – they have sat in both the therapist’s and the client’s chair! I am thrilled to be included in Alison’s post and list of ‘shout-outs’, and am excited to look into her other recommendations as well. In her short post you will find two reading suggestions of material written by clients – a blog and a book; and two reading suggestions of material written by therapists – again, a blog and a book. There is also a recommendation of a new podcast (and a video), by a therapist. Reading Alison’s post also reminded me that it’s been a while since I have written a ‘book review’, and there are at least a couple of recommendations I would love to share, in due course. In the meantime, if you have some reading time left before summer is on its way out (what an unwelcome thought) – do take a look at Alison’s recommendations, and ‘The Good Therapists‘ website itself! *It’s worth making it clear that this was a dialogue about therapy, not a ‘therapeutic discussion’ of the kind one might have in session. It was intended as an exploration of an interesting subject from two different viewpoints, and we were very clear and specific about the fact that it should not, at any point, start to ‘become therapy’. I must admit, I found that aspect of it harder than I thought it would be! As this post and Alison’s were prompted by thoughts of vacations and the end of summer, I thought I would gratuitously start this post by including a photo of somewhere I visited recently that had a very calming and relaxing effect on me and was a moment I will treasure from this long summer therapy break. Categories: Reblogs, Therapy | Tags: alison crosthwait the good therapists, borderline personality disorder, mental health, reading recommendations for therapists and clients, summer therapy reading, therapy | Permalink. I hope this is helpful to you if are thinking of starting therapy, if you are wondering whether to continue, or if you are simply looking at where you are in your current therapeutic journey, and are thinking about how you arrived at that point! Categories: Therapy | Tags: borderline personality disorder, BPD, choosing a therapist, first impressions when meeting your therapist, gut instinct in choosing a therapist, mental health, resolving conflict in therapy, therapeutic relationship, therapy | Permalink. At the end of ‘A new experience of mother, Part 3’, I wrote about how my therapist’s own words about the ‘mothering’ that she offers me, have been a constant source of comfort and security, and a reminder of who she really is. It’s important to add to this that they are also an indirect reminder of who she is not. The concept of experiencing my therapist as a ‘new mother’ really sunk in for me when I finally realised that she is not like my own mother; that she does not and will not behave towards me, in the way that my own mother did and does. And that realisation precisely mirrors the way in which I first made a positive connection with the ‘teenage part’ of myself (as described in ‘A new experience of mother, Part 1‘). She (my inner teenager) finally realised that I am not like my own mother, and that I don’t behave like her either (or at least, not most of the time!). As I was writing ‘A new experience of mother, Part 1’, I was frequently struck by the parallels between my relationship with my inner parts, and my therapist’s relationship with me. I realised that these two experiences were not separate, but completely interlinked. We were both trying to be ‘new mother’ to an often distrustful and angry child with a short memory, who acted out to feel loved – and all of a sudden I could feel a great deal more sympathy (and empathy) for what I had been putting my therapist through! In Part 1 of this post, I spoke about the fact that although I had forged a better relationship with and between my ‘inner parts’, there was an occasion on which the different ‘parts’ went back to being strangers to each other (and to me). This situation lasted a few days, and I mentioned that the key to my ‘inner reconciliation’ was my interaction with my therapist. What happened in that interaction was that instead of turning up to session in sarcastic and stand-offish mode (which I had been expecting to do), I somehow managed to keep sufficient control of that teenage side of me and instead went in with complete openness and a determination to be honest and vulnerable. In the past, I would have tried to keep up the appearance of co-operating while being internally resistant and closed off to my therapist. Instead, I said that I felt as though I really didn’t want to be there; my therapist simply asked if I could say something about why. And we talked. We talked honestly, clearly, and compassionately, and it was warm and connected and completely different to how I’d been feeling a few hours before. I realised that approaching with honesty and vulnerability had only been possible because I had also approached without fear. And approaching without fear was only possible because I was able to see her as ‘new mother’, or at least allow for that possibility. In the past I would have been too scared of her response and what she might think of me, to tell her that I didn’t want to be there. More than that, I would have worried that she would think I didn’t love her anymore. Because that is how my own mother would have interpreted the situation. I approached without fear of her response, but most importantly, without any sense of needing or wanting to control her response. I used to spend so much time worrying about what to say or do, in relation to her. What impact would it have, on her or on me? What was she likely to do or say in response? What would she think of me? Is saying ‘such and such’ too risky? Could I get hurt? Will she get angry? In the past, this never seemed like an attempt at control – in fact, I would have been horrified at the suggestion that that might be what I was doing. I have such an intense reaction against being controlled, that the thought of me doing that to someone else feels appalling. But the more I think about it, the more it seems that for years I poured my energy into attempts to try to indirectly control others’ responses, in an effort to feel loved and to stay ‘emotionally safe’. By endlessly analysing and trying to work how others might respond, I’d hoped to discover what I needed to say or do so as to minimize the negative impact both on me and on them. Looking at it now, it seems like an elaborate way of trying to feel less at sea, less helpless, and less at the mercy of others – a necessity when I have so little confidence in either them or me. This incident showed me that when I come to my therapist as ‘new mother’ – with a complete openness in terms of what I tell her, and a complete openness to her response rather than fear of it – what takes place in the room is beautiful and healing. And that is not simply about the words that are used, it is about the experience of relating in a new, safe, and intimately connected way. And that connection is internal as well as external – my ‘inner parts’ and I found our way back to each other because by being open about how they were really feeling, I gave them a chance to be fully heard, and to be responded to compassionately. The incident was also one in which my therapist and I talked about how our communication was changing, following my acceptance of her as ‘new mother’. In Part 1, I said that I made a connection with my ‘inner teenager’ as soon as she was able to see me differently (that is, to see that I was not the ‘old mother’ that she expected me to be). Thereafter, it became much easier for me to talk to her, and for her to hear me. Exactly the same was happening between me and my therapist. My therapist observed that if we have a misunderstanding and I don’t feel heard, this can trigger my fear (and expectation) of the presence of ‘old mother’. I will then see her in that role (along with all the judgment, disappointment and crossness that I expect), and this makes it almost impossible for my therapist to say or do anything right. Nothing she says or does can get through to me, because I can no longer hear it as it was intended. Everything is interpreted through the lens of my past knowledge and experience of ‘old mother’. Over recent weeks however, now that I am able to see her differently (much of the time), it is not just easier for me to talk to her (because of lack of fear), but also easier for me to hear her. It’s not that the words that she is using have changed, or that her facial expressions are different; it is that without the veil or fog of ‘old mother’ in the way, I can hear what she is really saying and intending, and I can see her for who she is. Categories: Attachment and relationships, Therapy, Uncategorized | Tags: borderline personality disorder, BPD, inner parts, reparenting in therapy, therapeutic relationship, therapist as mother, therapist as new mother, therapy | Permalink. I wrote these words, and placed them on this image, during the winter of 2014. I think it may have been shortly after writing ‘My borderline mind‘, which itself was written following some very emotionally challenging and intense therapy sessions. 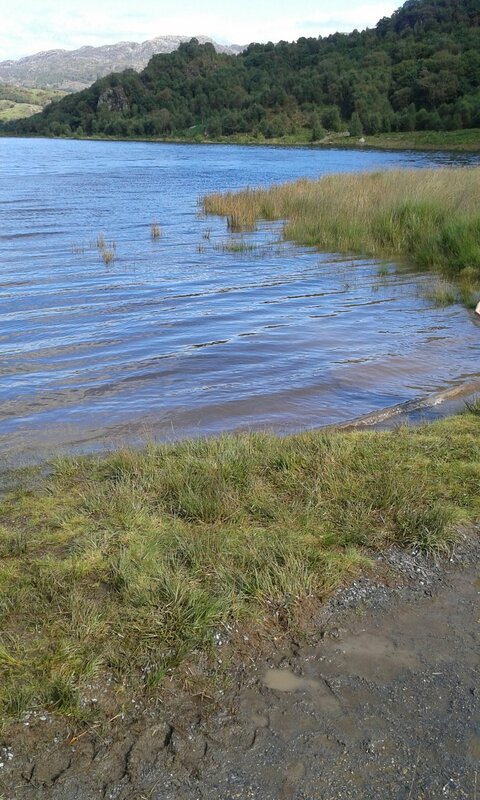 They were sessions in which I was testing my therapist, in which I was agonising over seeing everything through the lens of ‘obsessional attachment’, and in which I was despairing over ever being able to ‘do therapy right’. But they were also the sessions that culminated in the wonderful and precious occasion, described in ‘Waiting revisited‘, when my therapist mentioned her caring for me – something I was so desperate for and had doubted so often. The truth that began to dawn on me in December 2014 is now much more an accepted and lived out part of my life. I still have a deep and intense hunger and need to be loved, but that’s no longer associated with merger with another person, in the way that it used to be. It feels okay, even desirable, for that love to exist between two independent people who can truly see each other and have the freedom to care for each other because of their separateness, and not in spite of it. When it comes to my feelings for my therapist, I love her and I want to be loved by her; I want to walk alongside her and be with her, as we work together. And I want to be part of her in so far as I want her to keep me in mind and to remember me, and I want to be a significant part of her experience and her memories, just as she is, for me. But I don’t feel the need for the kind of ‘metaphysical’ merger that I used to crave; a merger that involved some kind of mingling of our atoms and a complete absorption of me into everything that she is. I used to want to lose myself in people; but now it strikes me that that defeats the point of wanting to be loved. I want to be found, seen, accepted and loved as a separate and special person, and I want to return the same feelings – and that requires separateness, and the freedom to be authentically ourselves. Categories: Attachment and relationships, Therapy | Tags: acceptance and caring require separateness, borderline personality disorder, BPD, bpd merger, merger with another person, the otherness of other people, therapeutic relationship, therapy, wanting to be loved | Permalink. You can hear something over and over again, but until you hear it at the right time, in the right context, in the right frame of mind and with the right understanding, it makes no impact. You can hear words and you may comprehend their meaning, but it may still not be clear what the words are meant to change, and how . In ‘Deprivation and Delinquency’, Donald Winnicott wrote about an occasion with a client, which he called a ‘mistake which nearly ended everything’. He made an interpretation for which, he says, ‘I had plenty of evidence, and indeed I was right, but the interpretation was given ten years too soon’. He added, ‘In the long treatment which followed, the patient re-organised herself…eventually she became ready for this interpretation….’. My therapist often made the point that she was different to my mother, and she made it in numerous ways. She made it by actually being different; by responding in ways I didn’t expect and then drawing my attention to the fact that I’d been anticipating the reaction my mother would have had. She was understanding when I expected judgment; caring when I expected criticism; comforting when I expected shaming. She made the point quite explicitly by saying that therapy offered me – she offered me – a different experience of mothering. I heard the words, and thought I understood them. But just as it took me a long time to realise that the work of therapy is meant to change the way I feel about myself, and not just to give me a deeper understanding of why I feel that way; so it took me a long time to realise how her words about mothering were meant to change our relationship and ultimately, to change me. To change me into someone who can trust and be vulnerable; someone who can feel secure even during absence; someone who can feel confident of being cared for. And it happened in the smallest and seemingly most insignificant of ways. The concept really took hold of me not during an emotional revelation or a painful retelling of the past, but as the result of a very ordinary conversation about my health. I had been having a few doctors’ appointments and blood tests for reasons which were unlikely to be connected to anything serious, though I was nevertheless anxious and sometimes let my fears run away with me. I would sometimes open a session by updating my therapist to let her know I would be having an appointment the next day, or had just had one. I told her when my results came back clear, or slightly elevated (though not worryingly so). And one day it struck me, after we had been talking about the idea of a new experience of mothering, that it now felt ‘natural’ for me to tell her about my health and my appointments –something I could never do with my own mother. My mother is incredibly anxious and any hint of ill health or unhappiness on my part, sends her into a spiral of worry and unhappiness of her own which she is unable to tolerate and therefore unloads onto me in an unconscious attempt to gain reassurance and to feel better. In addition, she has always been very intrusive, and would feel entitled to know more and to be kept updated; and as for mental health difficulties, as a teenager she simply told me I had no reason to be depressed. For all those reasons, I would never dream of sharing details of my life with her, and particularly details of my health; it is a simple matter of self-protection and survival. Her reactions would be overwhelming and it is hard enough to cope with my own. There were countless occasions when my therapist reacted with acceptance and understanding when my mother would have been appalled, anxious and invalidating. The occasion when I showed my therapist some recent cuts from self-harming, is a memorable and precious example. But it took my therapist’s calm and comforting response to my fairly ‘routine’ health checks, and my desire to share these details with her, for the concept of ‘new mother’ to really click and for me to really see her that way. Perhaps it needed a ‘less charged’ environment to let the point sink in; or perhaps it’s just another example of my therapist being right. She often talks about appreciating the ordinary, and finding meaning in ‘the small’ things and the day to day. The fact that I was comfortably discussing the business of my day to day appointments was an obvious, tangible and forceful sign that I accepted just how different she was to my own mother. And so it was, that a concept that had been around for a while, became a living, breathing thing, making a real difference and having an impact on my thinking, feeling, and behaviour. Since then, there have been some wonderful examples and reminders of that new mothering which have reinforced this game-changing (in more ways than one) realisation that has settled within me. At the end of ‘A new experience of mother, Part 2’, I described an occasion where, in the words of my therapist, I had ‘both the past mother and the new mother potentially in play at the same time and it is touch and go which one is stronger’. I managed to reach out for new mother rather than ‘act out’ based on my ‘old mother’ expectations that she would be disappointed in me (for not managing to make it through the weekend without emailing her). My therapist responded in a beautifully affirming and validating way, reassuring me that new mother was alive, and was not disappointed. A few days later, we were talking about the upcoming therapy break and I uttered a Freudian slip. My therapist had said that breaks were important because without them, I would have a very tired therapist. My unconscious thinking, as betrayed by my Freudian slip, is described in my post ‘Freud was right about some things’. My conscious thought process, however, was completely focused on her use of the word ‘therapist’. When we had finished laughing (and inwardly groaning in my case) over my ‘slip’, I tried to explain what was really preoccupying me and upsetting me. I said ‘You used the word therapist……’. My voice trailed off but she immediately understood, and added ‘….rather than ‘mother’. But I’m both’. Never one to accept my therapist’s words and interpretations without at least a tiny bit of resistance – and the tendency to focus on what I don’t have rather than on what I do – I tried to protest that that was all very well, but she wasn’t really my mother. But I couldn’t stop thinking about her words, and by the next session I saw things in a very different light. I felt guilty because I saw my response as rejecting; rejecting of a comforting and rather momentous truth. I really hoped it hadn’t come across as a rejection of her. What had struck me in the space between the two sessions, was the very obvious truth that being a mother (or a daughter) is about much more than biology. There are lots of different types of mothers: biological mothers, foster mothers, adoptive mothers, therapy mothers – and more. The definition is in the quality of the relationship – and the one that I share with my therapist can much more truthfully be called a mother-daughter relationship, than the empty one I have with my own mother. Her statement that she is both therapist and mother is one that I have thought about almost daily since then. It has sustained me, it has comforted me, it has helped me feel secure and has enabled me to be vulnerable. It reminds me of who she really is, and of who I can be, with her – and that creates a new experience of being together**, for both of us. *The similarities and the connection of the relationship between my ‘inner parts’ and me, and the relationship between me and my therapist, will be described in ‘A new experience of mother, Part 4’ and ‘A new experience of mother, Part 5’. **And, indeed, of being apart, particularly during this summer therapy break…. Categories: Therapy | Tags: being a parent to inner parts, borderline personality disorder, BPD, inner parts, re-parenting in therapy, therapeutic relationship, therapist as mother, therapist as new mother, therapy | Permalink. 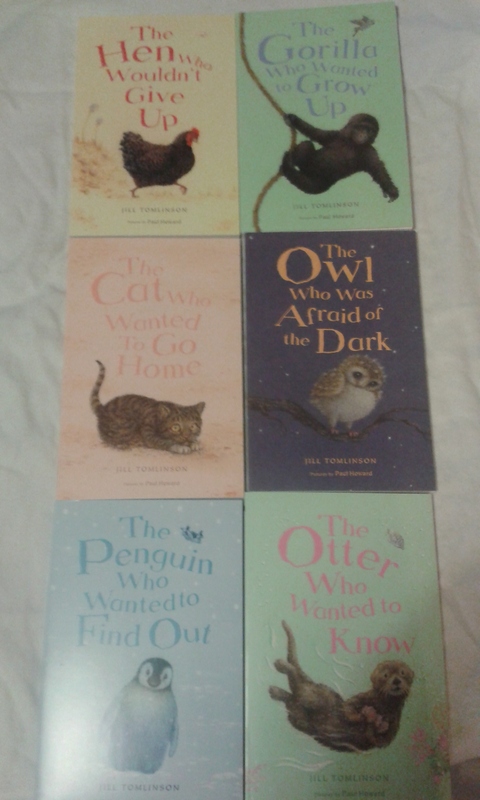 At the start of my summer therapy break I bought this wonderful box set of six children’s animal stories by Jill Tomlinson, with the intention of reading one a week during the break. I was introduced to them by one of my children who brought home from school ‘The owl who was afraid of the dark’. He didn’t seem that interested in it, but I loved it; and I saw in its chapters and in the progression of the story, similarities between the little owl’s journey from fear to confidence, to the stages of the therapeutic journey. Since then, I have wanted to read the other books in the collection, hoping that they too might contain some important and thought provoking lessons, just as crucial for grown-ups to learn as for children, but presented in a beautifully simple and moving way. 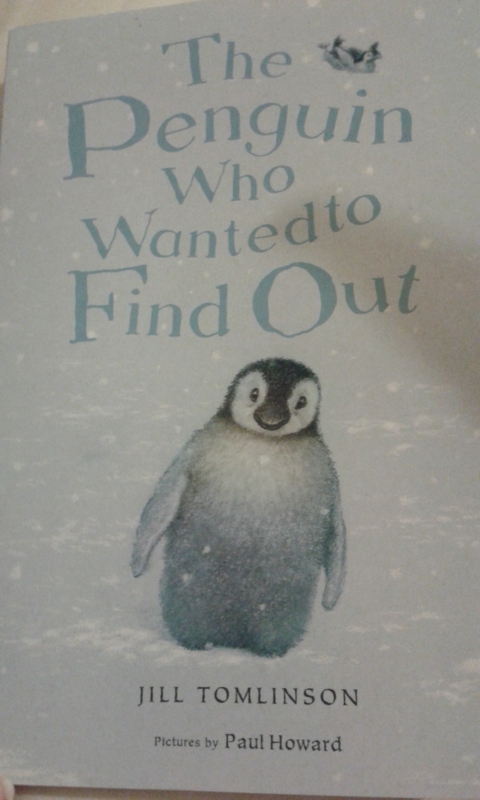 This week, I’m reading ‘The penguin who wanted to find out’, and the section above really struck me. It reminded me not just of the lessons I’m supposed to be learning over the therapy break (about keeping my therapist real and staying connected); but of the fact that eventually, the goal is to ‘internalise’ my therapist, and the process, in such a way as to enable me to fly the nest (though that is not quite the right metaphor when we’re talking about penguins!). 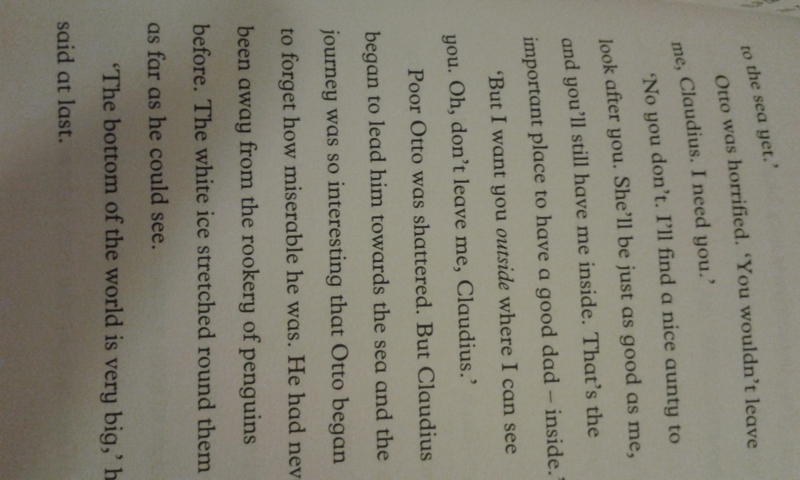 Claudius is a ‘daddy penguin’ looking after Otto, a little penguin. Claudius has just told Otto that he will need to leave him in order to go and look for food, as he has had nothing to eat all winter. How many of us, when our therapists ‘leave us’ to go and find their own nourishment of ‘down time’ and a rest, share, on some level, Otto’s horrified reaction? How many of us think, even if we don’t say, the words ‘you wouldn’t leave me….I need you’? And then, when we receive the response, as Otto did, that we carry our therapist with us, inside, how many of us can empathise deeply with Otto’s heartfelt protest that he wants his dad to be outside where he can see him? ‘Oh don’t leave me’ – for me, at least, that is a familiar internal refrain. And yet, as Claudius says, ‘that’s the important place to have a good dad [or mum, one might say] – inside’. I can’t always see my therapist, much as I would like to. Therapy breaks are good examples of that, and hard as they are they are also necessary periods in which I can learn and practice internalising my therapist, and holding onto to her ‘inside’, even when I can’t see her ‘outside’. It’s vital for that process to take place; it is the process of therapy, in many ways, and it will also be the only way in which I can permanently hold onto her and to everything she means to me and has shown me. ‘Poor Otto was shattered’. But at the same time he became interested in the journey he was taking towards the sea, and forgot a little bit, about his misery. Therapy breaks are still hard, and much more so on some days than others. But I have become more ‘practised’ at them; and I am trying to notice things about them, and about me and my reactions, that make the journey more interesting, rather than being only a trial to be endured. How does it turn out for Otto? I haven’t reached the end yet, so I don’t know, but I’m looking forward to finding out. Just as I am looking forward to finding out what happens to me, and what I have learned, when I see my therapist again, ‘on the outside’, in September. Categories: Therapy | Tags: borderline personality disorder, BPD, carrying therapist with us on the inside, coping with summer therapy break, feeling abandoned by therapist during break, internalising therapist, lessons from children's books, therapeutic relationship, therapy, therapy break as opportunity to learn | Permalink.